The recently concluded Filmfare South awards saw the sharing of major awards between two of the biggest blockbusters of 2014, Race Gurram and Manam. While Allu Arjun won the Best Actor award for Race Gurram, Manam won the Best Film honor. Yesterday, Allu Arjun dedicated his Filmfare award to the departed legend of Telugu Cinema, Akkineni Nageswara Rao. Bunny’s touching gesture was welcomed not only by Mega fans but also the Akkineni fans, who thanked and appreciated Bunny for his tribute to ANR. This afternoon, ANR’s son and popular actor Nagarjuna appreciated Bunny and tweeted, “Thank you Allu Arjun for dedicating your award to ANR and your words”. Such gestures only show the mutual respect and admiration between the high profile film families in Telugu film industry. 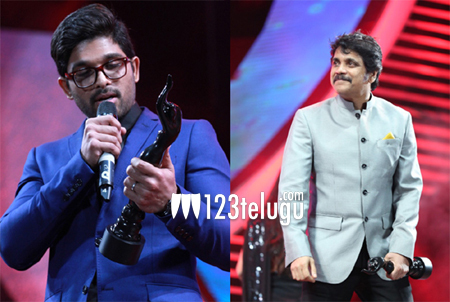 Thank you Allu Arjun for dedicating your award to ANR and your words?